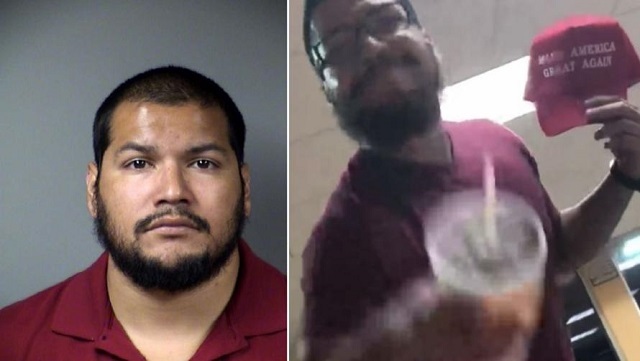 A Bexar County grand jury has indicted a 30-year-old San Antonio man who was arrested in July after he was captured on video grabbing a “Make America Great Again” cap from a teenager who was dining at a San Antonio Whataburger. Bexar County court records show Kino Jimenez was indicted Wednesday on a charge of theft of person, which is a state jail felony. He was located in Universal City in July by San Antonio police robbery task force detectives who took him into custody on an arrest warrant. Jimenez has a criminal record that includes misdemeanor offenses for marijuana possession and driving while intoxicated, according to court records. Shortly after his arrest, Rumble, a local bar, issued a statement that Jimenez was a part-time employee there and had been fired. Theft of person is a state jail felony punishable by a minimum of six months or maximum of two years in state jail. Jimenez, who has no felony convictions, would be eligible for probation or deferred adjudication if found guilty. He's being hit with felony charges, folks! If he did this in San Francisco instead of San Antonio he'd be given the keys to the city!